Rep. Ilhan Omar (D., Minn.) appeared to take credit on Twitter for the Democratic Party's decline in support for Israel Thursday. She shared two tweets from progressive organization MoveOn and from Rep. Alexandria Ocasio-Cortez's (D., N.Y.) chief of staff that praised Democrats for not attending the American Israel Public Affairs Committee's (AIPAC) annual Policy Conference. MoveOn is circulating a #SkipAIPAC petition asking Democratic presidential hopefuls to avoid next week's massive annual event. At present, none will attend. In a tweet, MoveOn accused AIPAC of "attempting to block the #IranDeal to giving platforms to Islamophobes & not condemning @GOP anti-Semitism." In a tweet, Ocasio-Cortez's chief of staff Saikat Chakrabarti directly credited Omar with causing the rift between the mainstream pro-Israel organization and progressive Democrats. "I hope it's not lost on anyone that this is a direct result of @IlhanMN's leadership," he wrote. "Thank you, @IlhanMN, for showing such courage." Sharing a tweet claiming Rep. Kevin McCarthy (R., Calif.) was "defending a foreign nation" and "attacking free speech rights of Americans," Omar added her own commentary. She claimed elected officials acted for Israel out of financial interest. "It's all about the Benjamins baby," she said in reference to $100 bills. 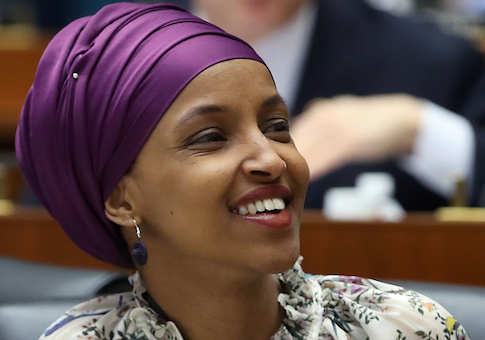 Batya Ungar-Sargon, opinion editor of the Jewish Daily Forward, replied to note it was "the second anti-Semitic trope you've tweeted," and asked Omar who was "paying American politicians to be pro-Israel." Omar received condemnation from members of her own party for her repeated anti-Semitic comments. Omar later agreed that her comments were anti-Semitic, and offered an "unequivocal" apology. In the same apology, she returned to her critique of AIPAC. Omar now denies that February comment was anti-Semitic, or that she ever apologized for the comment itself. Though she deleted the offending tweet, her Twitter page still hosts several retweets of others claiming her original comments were not anti-Semitic. This entry was posted in Politics and tagged AIPAC, Ilhan Omar. Bookmark the permalink.